Dexter Morgan is an ordinary guy, he works as a blood spatter analyst for the Miami Metro Police Department and has a cute girlfriend. He may act a bit strange sometimes, but he's a pretty nice guy. At least, that's what Dexter's friends and neighbours probably think about him. And it's exactly what he wants them to believe. The protagonist of Dexter isn't an ordinary guy, he has a dark secret. A Dark Passenger. Dexter may appear very normal, but he isn't. He feels nothing, he's an empty shell, who acts as if he's human but deep inside him his Dark Passenger urges him to kill. However, what sets Dexter apart from the run-off-the-mill serial killer is that he follows a code, the code of Harry, a basic set of rules his foster father taught him to channel his homicidal urges into something positive and to prevent him from getting caught. Dexter only allows his Dark Passenger to kill murderers, and he's polite enough to make absolute sure all of his victims are really guilty. Dexter basically takes out the garbage that slipped through the justice system, and doesn't harm innocent people. Most of you will probably know Dexter Morgan from the Showtime TV series Dexter, the first season of the TV show was based on Darkly Dreaming Dexter. Before I bought this book I had already seen the first two seasons of Dexter, I liked the series a lot and decided to check out if the books were any good. Darkly Dreaming Dexter introduces you to Dexter and his background, but the main plot of the book is the hunt on a new serial killer who starts terrorizing Miami's prostitutes. Deep inside, Dexter is fascinated by the style and skill of this serial killer and he starts to admire his work. Wile his ambitious sister, Deborah, calls in his help as she sees this case as a way to climb up the ladder from the Vice unit into Homicide, Dexter starts discovering he's somehow connected to the shocking murders. The serial killer seems to have a special interest in Dexter, things get complicated and ultimately less and less of the events make sense to Dexter. He seems to know an awful lot about the crimes, and Dexter starts to believe he may be going insane. Could it really be that he has an alter ego who commits these gruesome murders? 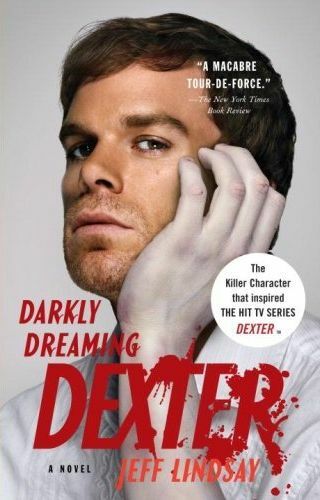 Pictured above the the version of Darkly Dreaming Dexter with the Showtime TV series cover. Darkly Dreaming Dexter was written by Jeff Linsday in 2004, a year later Dearly Devoted Dexter arrived and last year Linsday published Dexter in the Dark, the third book in the Dexter series. A fourth Dexter book is also on its way, it's called Dexter by Design and should be available next year. Dexter is one of the few sociopathic killer's you'll truly identify with, he's a witty man and he's actually pretty adorable for a monster. While Dexter does terrible things in his free time, it's not hard to see him as one of the good guys. He's the perfect anti-hero. As I said, I watched the TV series first and while reading this book I discovered the series is only loosely based on the book. Actor Michael C. Hall does a great job as Dexter in the series, and I have to admit I could almost hear his voice in my head while reading one of the many first-person narrative parts of the book. There are many big differences between the show and the book, and I was surprised the ending is even completely different. The TV show has more content too, it focuses more on the minor characters and has a lot more sub-plots. That shouldn't really surprise though, as Darkly Dreaming Dexter is just 300 pages long and that's not enough to fill 12 one-hour long episodes. Overall Darkly Dreaming Dexter is a good thriller but unfortunately it's not as good as the show. It doesn't happen a lot that a movie or series is better than the book it's based on, but Dexter is one of these rare cases as Showtime really did a superb job on the TV show. As a fan of the show, I think the characters in the book are underdeveloped and that the plot of the first season of Dexter has a lot more depth than the one you'll find in this book. The novel tells an intriguing story but if you watched the TV show first it may be a small disappointment as the book doesn't reach the same heights as the series. It's not a bad novel, but if I had to choose between the first season of Dexter and this book, I'd definitely pick the TV show. I give Darkly Dreaming Dexter a 8/10. You can get the book at Amazon for just $10.36.